Behold, the miracle of life… packed into cubes! 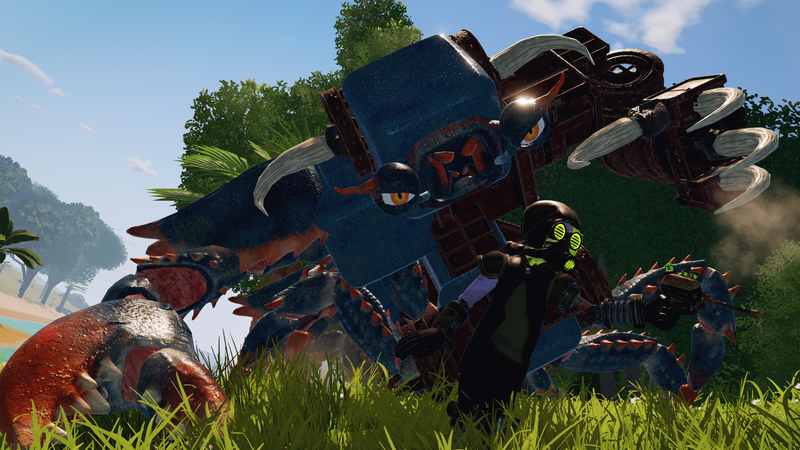 Create fantastic creatures in an open-world sandbox game like no other. Explore, craft, and survive — all with the help of your very own creations. Bring living, breathing creatures to life in any size, shape, or combination you can imagine. Whether you build tiny pets or enormous abominations, they’ll all have genuine personalities and feelings that respond to your actions and the world around them. One may be smiling at you, eager to be your new best friend, while another may snarling at you and giving you stink-eye. The latter has most likely decided that you look delicious, so maybe you should run? Lifeblocks have different stats and abilities built into them. Some are strong, some are fast, some shoot blinding ink, some poison enemies…they can all be used to your advantage to make creatures more effective. A creature with a strong beak can chop down trees more quickly than you can. And you’ll definitely want a creature with a water-blast ability with you while you explore that dragon’s cave… unless you like being on fire? Your creatures will help you gather resources in order to craft a wide array of tools, items, and structures. Collect unique lifeblocks to upgrade your creatures with new abilities. Build a homestead to protect them from thieving poachers. Start a farm to grow crops so you don’t go hungry. The better resources you have, the better the things you can craft, so you’ll need to scavenge if you like that whole “staying alive” thing. The world around you is teeming with life, some friendly and some… not-so-friendly. 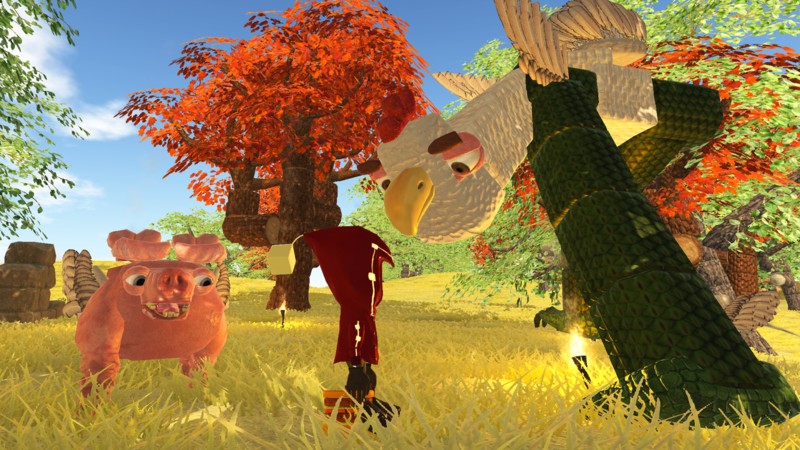 You’ll need to work together with your creature companions to survive the many dangers of CHKN, avoid starvation, and defend your thriving homestead. There are three-headed dragons to fight and poachers to defeat. There are secret caves to explore, beaches to roam, and lush valleys to scavenge. There are also other, more mysterious things to discover but, you know, SPOILERS. If you want to survive island life as a group, or collaborate on a giant creature with a few of your buddies, you can open your game up for multiplayer. Invite your friends to join you in any mode, and see what you can accomplish together. Or maybe you prefer to set up different homesteads and compete for resources to see who comes out on top? It’s up to you. Multiplayer Disclaimer: The current version is an early alpha so it may not work for some of you and there will be bugs. If you want to give it a go to help us test and share your feedback, you can try it out using these instructions. Thanks! Mysteries to unlock: what are those mysterious beams of light shooting into the sky? Find them and unlock their secret! For press inquiries please contact heychkn@katapultstudio.com. This update gives a performance boost to min spec computers. If you’ve had “lag” or framerate issues in the past, please try out this build and join us over on Discord to let us know how it works for you! 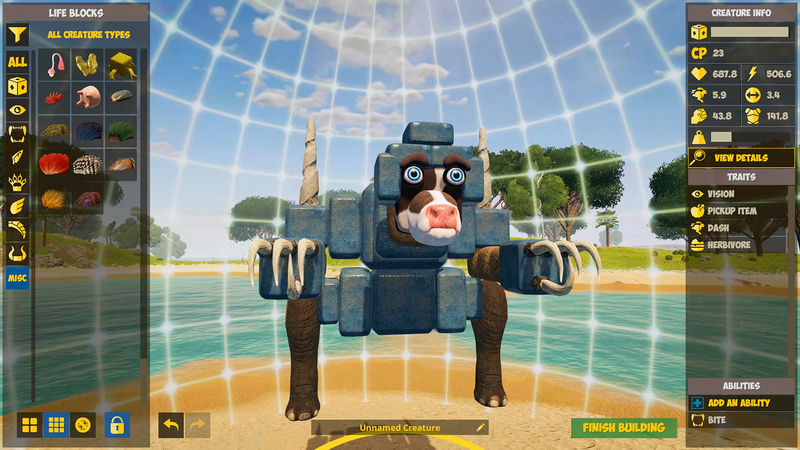 We also added a variety of new Life Block sizes so you can build even more interesting creatures. Save them to the Workshop and share them with us - we want to see! Additional Life Block body sizes added: Small, Medium, Large, XLarge, XXLarge, and all their half sizes are now available for all animal types to give you more variety and build options. Perfect sizes for additional extremities or a lovely armored hat. Creature/Temple world generation has been tuned. If you haven’t checked out the new larger world, now’s a good time! 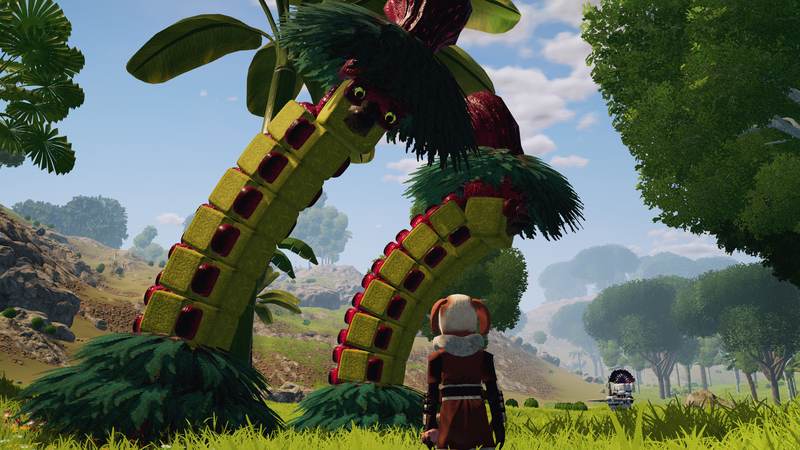 It’s procedurally generated and player-created creatures can spawn in the wild. You never know what you’ll run into. The enemy of my enemy is… still my enemy. Like these Octopalms created by Cohollow. Majestic! And quite fashionable actually. Just defeat the boss and the upgrade is yours! Easy, right? Many thanks to the CHKNeers on Discord. They’ve been helping us find and fix bugs in our Pre-Release test updates and it’s a big help! It’s also a great place to show off your creations! 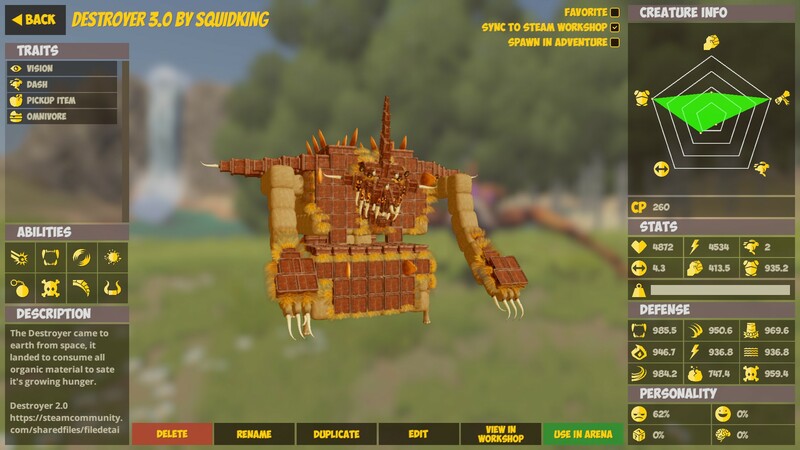 Here’s the newest version of an old favorite, Destroyer 3.0 by squidking. 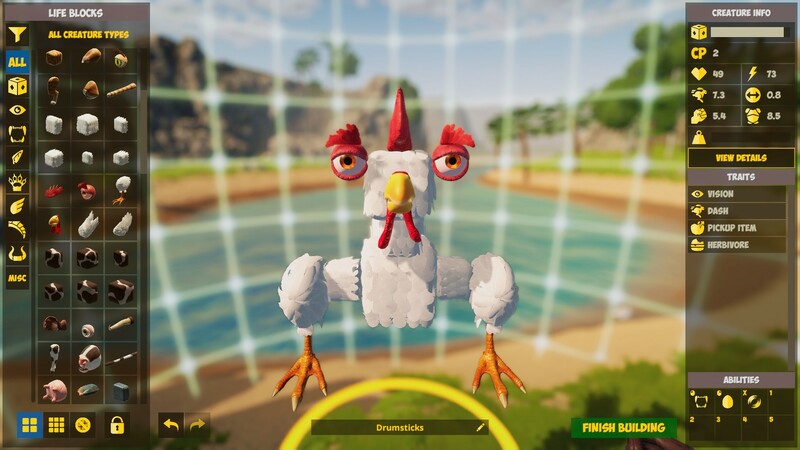 So join the CHKN Discord if you want to help us test new builds before they’re released, find new friends for multiplayer, get creature ideas, or share your CHKN suggestions. Also, someone Photoshopped chicken wings onto their real dog. That happened. Arena battle updates, new creature blocks, homestead makeovers, performance optimizations, and more! A new build with tons of new features! 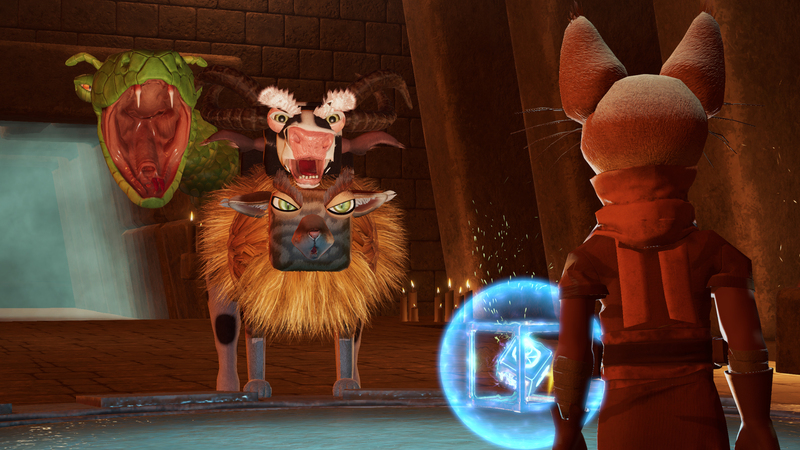 New abilities, revamped creature builder, new Adventure Mode in progress, and tons more. Ok, I'm not sure what this is, but I take it, it's some kind of wilderness survival game?